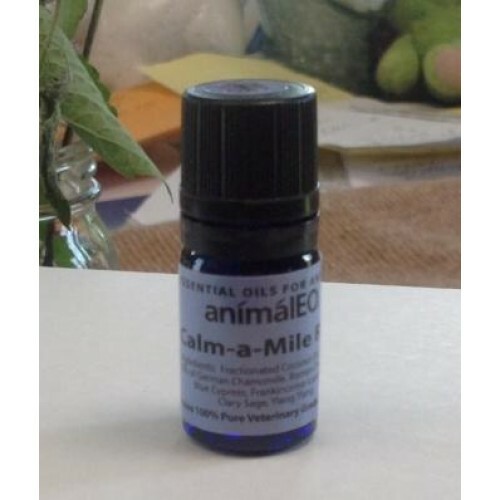 Just a few drops of Calm-a-Mile RTU essential oil on your dog's Sniff-It™ (sold separately) helps your dog to focus and be calm by working at a cellular level to positively impact body and brain function. HOW LONG DOES A 5 ML BOTTLE OF CALM-O-MILE RTU LAST? It does vary with thicker or thinner oils - but usually a 5ml will have 85-100 drops in it...meaning that if you use it daily, it will last approximately THREE MONTHS! AT $20. a bottle, that's less than $7 a month --- a great deal! HOW LONG IS THE OIL EFFECTIVE ONCE IT IS APPLIED TO THE SNIFF-IT? One drop of oil will last between 9-12 hours. When not in use it will remain "as new" if placed securely back in its plastic carrier bag. These are special archival bags. If you use a regular zip bag, it will lose its effectiveness the same as if it were being used.